Do your rooms or carpets smell bad and you’re not sure what to do? An Easy Carpet Cleaning and Deodorizing Tip in Birmingham AL can help eliminate bad smells and odors in your carpets and it doesn’t cost much at all. An inexpensive way to keep your carpets smelling fresh is with baking soda. A box of baking soda now-a-days costs about 50 cents and it has tons of uses around the house. One of them is to absorb bad smells and odors in your carpets. All you have to do to easily freshen a room or carpet that smells, is to sprinkle some baking soda over the areas that smell. Let it stand for a little while; anywhere from 30 minutes to a couple hours. Then, just vacuum it up. The baking soda will help to absorb odors in the carpet and make your room smell fresher. Baking soda is a natural substance so it is safe to use and a lot better than harsh chemicals especially if you have children or pets. If you have dirty carpets with really bad odors and you want an even easier solution, call the professionals at Heaven’s Best of Birmingham. We have many cleaning solutions and deodorizers to work on just about any stain or smell you have. We will thoroughly clean and deodorize your carpets and a bonus is that they dry in 1 Hour. Ask about our different scents of our deodorizers. Our best-selling deodorizer is a citrus scent that just about everyone loves. It will make your home smell fresh and clean. We also offer a cherry almond deodorizer that is a very nice scent, especially for the holidays. Call Heaven’s Best Carpet and Upholstery Cleaning at (205) 618-9150 to schedule an appointment for cleaner fresher smelling carpets. 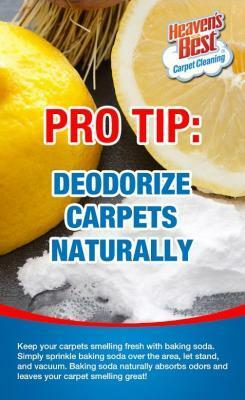 Or, try this easy carpet cleaner and deodorizer tip in Birmingham AL. Contact Heaven's Best for Professional Cleaning & Deodorizing!